It is hard to think now that Labyrinth, the Jim Henson-directed film from 1986, was poorly received when it first hit cinema screens. In the year 2016, it is just as much fun as when I first viewed it on video so long ago. The fact it has become something which is close to film fans hearts is amazing, and with a baby boy now in my life, I cannot wait until he is old enough to watch it with me, and get the same buzz I had on my first viewing of this flick. It is certainly a film which has grown more popular with age and (for the most part) they don’t seem to make children’s fantasy movies like this anymore. So in tribute to Jim Henson, David Bowie and all those other people (like Terry Jones and Brian Froud) who helped make this incredible movie, we give thanks. With the movies 30th anniversary fast approaching us (June 27), it seems a great time to delve into the Goblin King’s lair again and see what kind of collectibles are out there to commemorate this film’s lasting appeal. And what better place to start than looking at its return to the big screen? Fathom Events is putting Labyrinth back on at a select few theaters from September 11-14. USA Today has reported there will be exclusive content shown at these screenings, but whether that is footage from the new Blu-Ray release, or additional exclusive footage is unclear. Still a chance to see the movie on the big screen (the first wide release since 1986) should not be turned down. Speaking of the Blu-Ray, this new release comes in a variety of editions all pretty awesome in their own right. The standard DVD release comes in this beautifully created cover (from the original VHS artwork) which has all your favorite characters from the movie doing their thing. But it’s the Blu-Ray special edition which will really be getting Labyrinth fans hot under the collar. Blu Ray.com has the specs for the disc release and the extras (which you can see below), but before you do, just take a look at the incredible 3D cover and slipcase that has been created for this release. Amazing. Jennifer Connelly and the Henson family talk about the art of puppetry and the magic of Jim Henson, along with a visit to the “Center for Puppetry Arts” featuring The Jim Henson Collection and over 100 puppets from Labyrinth. Hosted by Mythbuster’s Adam Savage with participants Brian Henson, David Goelz and Karen Prell, and surprise guest Sheri Weiser. Remembering David Bowie with co-star Jennifer Connelly, and Jim Henson’s children Brian Henson and Cheryl Henson. Watch out for this release coming September 20th and retailing for about $76.00. To follow this release, we also have a new comic book coming out. A Manga release called Return to Labyrinth was released in 2006, and ran for four volumes. Drawn by Chris Lie and written by Jake .T Forbes, this was an authorized sequel which followed the adventures of Toby, who is now in his teens getting drawn back into the world of the Labyrinth. But it’s the new books we are interested in here, and Entertainment Weekly showcased some examples of the pages we can expect to see from these comic books and they look pretty great. BOOM! Studios’ Archaia imprint, and the Jim Henson Company have teamed together to give us not just one, but three new comic books! Jim Henson’s Labyrinth: 30th Anniversary Special which will be a 48-page special comprised of short stories about characters from the Labyrinth universe. This is set for release in August. Some of the stories originally appeared in Free Comic Book day comics, so this is a great chance to get those stories combined in one nice package. Next, we have the artist tribute issue which will have the likes of Mike Allred, Dave McKean, Eric Powell, Jill Thompson, David Mack, and Faith Erin Hicks all contributing art pieces based on the world of the Labyrinth. No dates for these two as of yet, but I imagine they will not be too far behind the 30th Anniversary Special. And finally, there’s Labyrinth: The Ultimate Visual History. Available for preorder now, the book releases this October. Labyrinth: The Ultimate Visual History is the definitive thirtieth-anniversary exploration of the beloved Jim Henson classic, featuring rare artwork, interviews, and on-set photos. 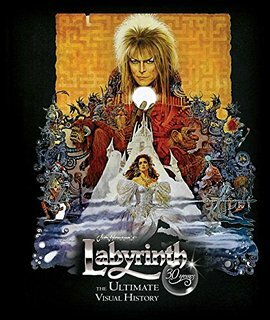 Three decades after its release, Labyrinth, starring Jennifer Connelly and David Bowie, continues to enthrall audiences with its winning mixture of fairy tale whimsy, fantastical creatures, and unforgettable music. Filled with a wealth of rare and unseen behind-the-scenes imagery, Labyrinth: The Ultimate Visual History explores the creation of the film as seen through the eyes of the artists, costume designers, and creature creators who gave the beloved fantasy classic its distinctive look. Featuring in-depth interviews with the talented crew and cast, this deluxe book brings together a wealth of rare sketches and concept art with numerous insert items, such as story notes from Jim Henson, sketches from character designer Brian Froud, and many more treats for fans of the film. With stunning visuals and unparalleled insight into the creation of a true modern classic, Labyrinth: The Ultimate Visual History is the perfect companion piece to one of the best-loved fantasy films of all time. Being a bit of a table top nerd myself, I was delighted to find out about this latest piece of news, an awesome Jim Henson endorsed Labyrinth board game! The plot of the game seems to follow the film quite accurately. This is the maze that players must navigate every time they wish to save Sarah’s baby brother. Each game is different with the blank card spaces being filled with the magical encounters and monsters that are depicted on the deck of cards that comes with the game, this ensures a great deal of replayability and unpredictability in the game, giving the Labyrinth its signature feel. The game consists of two distinct stages, one where the group must adventure through the labyrinth trying to find the goblin city whilst keeping their willpower as high as possible (nobody wants to fall into the oubliette! ), and a second action-packed stage where the players must fight their way into Jareth’s castle where Sarah must say the magical words that will release her brother. – 5 highly collectible figurine renditions of the main characters. – Game board lavishly illustrated with inspiring new artwork featuring all the legendary places from the movie, including the Oubliette, the Bog of Eternal Stench, the Goblin City and Jareth’s Castle. Just look at the craftsmanship of these sculpted figures below to see what attention to detail has been put onto these board game miniatures. The game is already available for pre-order via the River Horse website for $40, so you to can explore the Labyrinth just like Sarah and co did. If you fancy enjoying Labyrinth in a more cosplay manner and are going to Dragon Con, then the Center for Puppetry Arts Labyrinth Masquerade Ball may be the place for you. They are throwing an event on the 1st of September which has a plethora of Labyrinth inspired goodies to absorb. As well as an appearance by Brian Henson, unseen photos from the movie, prizes and the music soundtrack blaring out you will also get to see the exhibition itself. According to AJC news it has some new entries especially for this event. About 25 new Labyrinth-related objects will be in the exhibit, including Bowie’s costume from the M.C. Escher-inspired stairway scene, goblins from the climactic battle and a plaster version of the Hoggle character’s head. So as you can see there will be plenty to be getting on with within the next few months and its hard to find fault with a movie still loved to this day, even if Honest Trailers tried. If they love it you know it is a film to treasure for the ages. Lastly we have these great art pieces created by Aelia Petro for a Labyrinth encyclopedia style book she created on Facebook. Nothing to do with the 30th anniversary, but it looked too cool not to include here and it nicely ties off a full few months of pure Labyrinth action. Tabletop games (like the new Labyrinth board game) are fast becoming one of the most popular past times and Grizzly Bomb covers a collection of them in Table Top Bonanza articles we do. Finally in the spirit of Labyrinth we have artist James Hance who loves mixing Muppets with popular culture in his prints. Images: Paul Shipper, The Jim Henson Company, Center for Puppetry Arts, River Horse, Entertainment Weekly, BOOM! Studios, Archaia, TriStar Pictures, Brian Froud, Chris Lie, Tokyo Pop, Chris Lie, Aelia Petro.